This realistic 1:1 scale electric air gun offers continuous shooting with high-powered action. Features a variable Hop Up system and adjustable rear sight. Also equipped with handy flash light and red dot laser sight. Shoots lightweight 6mm BB Bullets. Includes safety glasses, aiming device, and 100 BB Bullets. Disclaimer: Orange tips are required by Federal law. Do not remove the orange tip found on your airsoft gun. 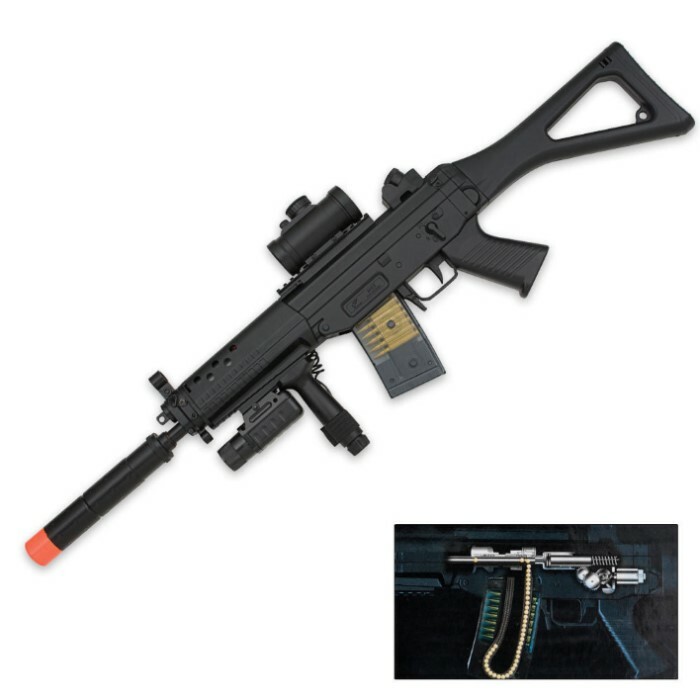 I just ordered this gun yesterday and I cant wait to receive it!!! I had an airsoft war with my little cuzin and I thought, "I could really use a new gun!!" so I went inside hopped on budk (my all time favorite site) and went to airsoft saw this gun and I was like woah that thing is awesome and a great price too!! So I ordered it waiting for it to arrive!! Thanks budk!!! The battery is very long lasting for hours of shooting. I have had one for close to a month now and haven't charged it. Its a cog is garbage so is the laser but other than that its pretty good, its got a good rate of fire also. Solid gun all the stuff that it comes with makes it 100% worth paying only 40 bucks. Wish the clip was bigger but as its a small gun if you take care of it will last you. i like the full auto but not really any firepower.